Veterinarians and volunteers evacuated five lions, five monkeys, four ostriches, three peacocks, two wolves, foxes, porcupines, 10 squirrels and a hyena to be resituated in Jordan and South Africa. Zoo workers treat animals at a zoo in Rafah, in the southern Gaza Strip, on April 7, 2019, as they prepare to ship them to safe sanctuaries in Jordan and South Africa. Photo by Abed Rahim Khatib/Flash90. 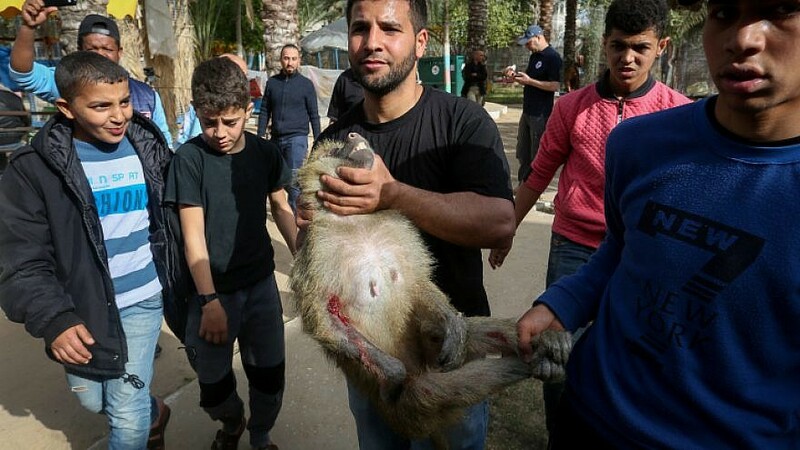 (April 8, 2019 / JNS) Approximately 40 neglected zoo animals were evacuated on Sunday from a dilapidated zoo in the Gaza Strip by an international animal-welfare group, the fourth such rescue mission from the Hamas-controlled area.